Skeleton Man was selected by my colleagues for our pairwork during training from Columbia University Teacher College Reading and Writing Project. When I saw the cover, I was excited because I am eager to read more “boy books”. Wasn’t I surprised when I learned that the protagonist is a sixth grade Native American named Molly? Growing up, she had heard the folklore of a man who ate his own body and then all of his relatives. She thought the Skeleton Man was just a story until her parents didn’t return home one night and she was adopted by a mysterious ‘uncle’ who she had never met before and who had skin so thin that his bones were visible. As things get stranger and stranger, Molly realizes that she needs to be clever in order to defeat the Skeleton Man and not be devoured herself. 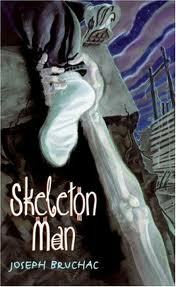 I loved Skeleton Man for its relatable and strong heroine, authentic inclusion of Native American culture, and constant suspense. It’s the last attribute that will hook the readers in my class. Most of the chapters end in a way that will have them clamoring to read just a few more pages and find out what will happen next. Although it isn’t the “boy book” that I expected from the cover, it is a book that most boys will enjoy, particularly 5th and 6th graders who are developing their abilities to make inferences and predictions. It’s a quick read that would be a fun read-aloud or literature circle selection. I haven't read this one yet, mainly because the boys in my class keep grabbing it off the shelf. They don't seem to mind the female protagonist at all!